Come join us on Sunday, Dec. 2 for the 10th annual GLAM Craft Show, once again at First Magnitude Brewing Company in Gainesville, FL! As always we'll have a well-curated selection of artisan gifts from makers here in Gainesville and beyond. The food trucks will be back, and First Magnitude's tap room will be serving beer, wine, and kombucha all on tap. Admission is free. 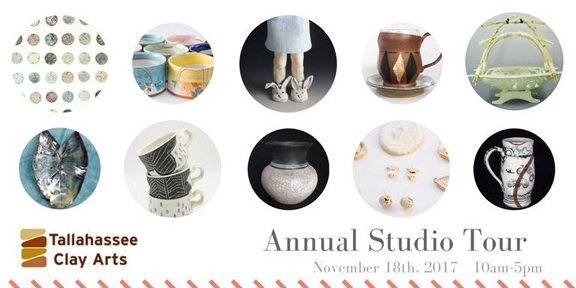 TCA's Fourth Annual Ceramic Studio Tour. Visit ceramic artists in their home studios to find handmade treasures for gifting. This self guided tour is free. Ten locations to shop from this year! Click HERE for more info or stop by my studio in Railroad Square to pick up a map of participating studios. It's Artisans in the Garden time again! Really looking forward to hosting over 50 exciting, local artists in many types of media. Please join us for wonderful food, lively music, and creative people sharing their talents with us. Great Christmas shopping opportunities too! Stop by to meet the artists and share refreshments on Thursday evening at City Hall Gallery in Tallahassee. Memory offers a vehicle for transcending the confines of time and space. In that way, it is not unlike the artmaking process where exploration is encouraged and boundaries are blurry. There is a direct relationship between memory and imagination and both are used to conjure mental images. In this exhibition, the works of artists Deon Lewis, Charity Myers and Julie Guyot make those visions concrete. Through painting, photography, sculpture and fiber, each artist recalls stories to be shared and experienced by others. The works on display represent a sense of nostalgia, family histories and past encounters. Join us for our annual 20% off sale on all handmade ceramics. It's the only time I put everything on sale all year. Check out new styles for 2018. Stop by to watch me demonstrate how I make some of your favorite Julie Guyot Studio handmade ceramic pieces. Ask questions and get a behind the scenes look at my process. Browse all the new handmade products in the showroom while munching on light refreshments. RSVP at the Facebook event page. 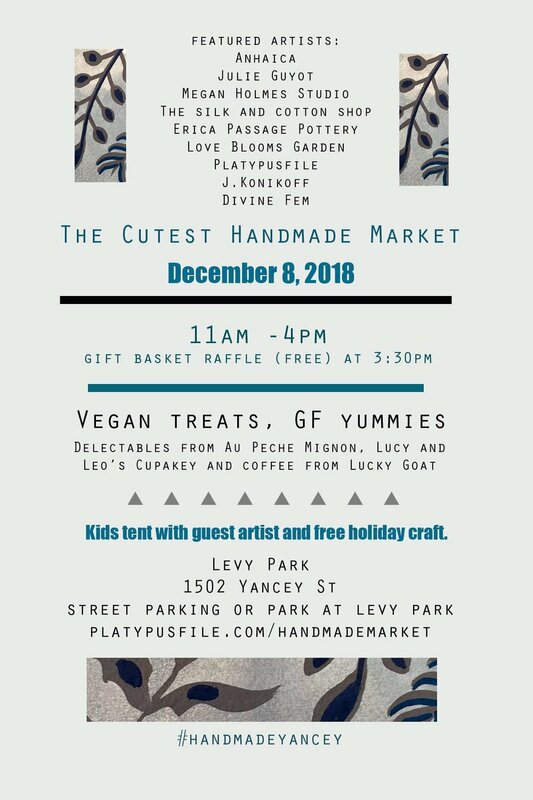 Join us for handmade holiday shopping and my favorite hot apple cider! Artisans in the Garden show at Tallahassee Nurseries! Pop-Up Shop w/ The Silk and Cotton Shop! Join us for cupcakes and browse the new stationary line by local Tallahassee gem, The Silk and Cotton Shop. She's bringing in tons of new cards for all occasions. So popular we brought her back for a second workshop!! Supplies are included. No refunds but if you are unable to attend at the last minute, you may transfer your registration over to someone else. Participants will come way with one Windsor Newton Sable brush, a palette tray and Imaginary portraits of women done on watercolor paper. This will be a 2 hour workshop where we will experiment with a wet on wet watercolor technique. This allows for magical accidental moments where the paint takes on a life of it's own. Rather than striving for one complete image we will make many during our afternoon. Feel free to bring photos of people that might inspire our process but by no means feel limited to those faces. Our portraits will yield unexpected results which is part of the process. It's time for our annual July sale and we've added a new event this year. Janae Easton will be launching her new designs and leading a workshop from 3-5. There will be air conditioning and cupckakes! Bring a friend and say hi. (You must register and pay for Janae's workshop HERE in advance). It's my birthday month! Stop in for some wine and cheese and take a look at all the new goodies I have in the showroom. Mothers Day is just around the corner and it's never too soon to be prepared with handmade artisan gifts, made in your backyard. (I have lots of new vendors in the showroom, including paper and stationary goods as well as bath items.) Click on the picture above to rsvp. This year I will be joining together with the Pop Shop and Curio in Railroad Square Art Park. We will all be offering a great selection of unique gifts for your holiday shopping. I've added a Wishlist Service to make life easier for your family. Just tell us what you'd like and we'll e-mail it to that special someone, send an invoice and your gifts are all wrapped and ready for pick-up! Super easy. I will be at the GLAM show and sale in Gainesville in December. Hope to see some of you there. Noonday Collection uses fashion to create meaningful opportunities for people in vulnerable communities around the world. Artisan businesses in twelve countries use traditional crafts and arts to make an inspired, exclusive line of gorgeous accessories sold here in the U.S. People have dignified jobs and hope as a result. Come try on these inspired accessories, then order plenty of them to empower people across the globe. Come out to the showroom to meet Jovita Woodrich, a Noonday Ambassador. There will be light refreshments and lots of accessories to shop! Start at my studio at Railroad Square Artpark and then head around town to see all the ceramics and pottery that Tallahassee Clay Arts has to offer! FREE. Click HERE for the google maps directions to all the studios. The Showroom will be closed on Friday the 11th and Saturday the 12th but come out to Tallahassee Nurseries to say hi on Saturday! Preview Party at the new studio! Join me for a preview of the new studio and showroom. Light refreshments and beverages will be served as you shop the showroom filled with new ceramics just out of the kiln as well as some new products by regional artisans including sea salt blends, candles and table linens. Stop by and say hello.